Meeting with Ann Lindemeyer Burckhardt (’55 home economics journalism) at her Edina, Minn., apartment was – dare I say it? – well, it was like meeting with Betty Crocker herself. OK, I know Betty Crocker isn’t a real person. But if she was real, I imagine that she would be just like Ann Burckhardt. But before you think I’ve gone and stereotyped Ann as an apron-wearing (which she is), cookie-baking (which she is), grandmotherly type who spends all her time in the kitchen, let’s get something straight: She is one tough cookie (no pun intended). She’s smart, she’s independent, she’s an entrepreneur, and she is still making things happen at the age of 79. Ann greeted Jim and me in the hallway of her high-rise cooperative with a huge smile and a big “There you are!” before ushering us into her two-bedroom apartment – one of which, she points out, is her office. On her table is a tray of cookies with three glasses for “mock champagne” (equal parts apple juice and ginger ale – delicious!). “Oh, you baked us cookies,” I say. And that is Ann in a nutshell. She was, indeed, editor of the famous red 1963 Betty Crocker’s Cooky Book – as well as editing the even-more-famous Betty Crocker’s New Picture Cook Book and many other general and specialty cookbooks produced by the Betty Crocker Kitchens between 1956 and 1963. “I really cut my teeth in those kitchens,” she says. All told, she worked on 11 books for Betty Crocker. Books that sold millions. Books that taught generations of young newlyweds how to cook. 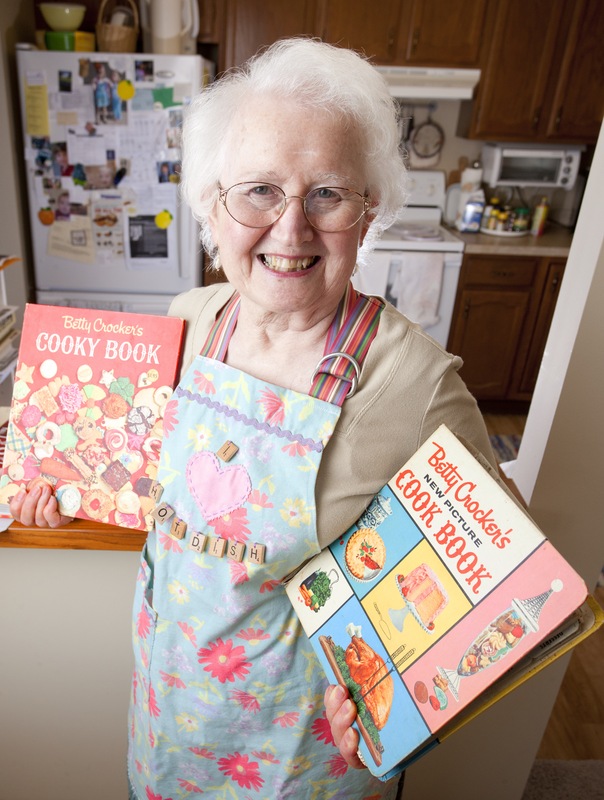 She had every one of the cookbooks she authored or edited spread out on her dining room table for us to look at, except for one: the original Betty Crocker’s Dinner for Two booklet, which sold for one dollar. Sadly, she does not have a copy of that one. Ann grew up in Strawberry Point, Iowa. Her father ran the newspaper there. Ann wanted to be a librarian but ultimately followed in her father’s footsteps. For 24 years (from 1971 to 1995) she was a reporter, columnist, and food editor for the “Taste” section of the Minneapolis Star-Tribune. For seven years (1990-1997) she also ran the Park Row Bed and Breakfast in St. Peter, Minn., serving “lovely” breakfasts, including her famous hash brown quiche. Somehow, between the writing and the editing and the running of a B&B, Ann raised a daughter, Barbara, now 43. And she found time to travel: She’s been to Europe 10 times for a month each time, learning to love Greek and Italian and other multi-ethnic foods. “I call it ‘traveling on your stomach,’” she says. These days, Ann cooks mostly for herself: soups, salads, quick breads, and the like. “With each passing year, I relax a little more,” she says. Jim and I could literally have spent days talking to Ann. P.S. If you e-mail me with your address, I will send you one of my recent books. Hi Ann – My name is Vicki Maas and I met you at your B & B in St. Peter back in 1996 or so. You had some kind of a luncheon going on. We actually ran in to each other once in a while in St. Peter and then I stopped by for a visit at your home when you moved to the South end of town…. I was always in awe because you were just so friendly and cheery and always welcoming. I actually have a recipe of yours cut out from the news paper and I have it pasted in my cook book – it’s the Ham/wild rice quiche. I just made it last night and it was so good! I googled your name and here you are! I’m sure you don’t remember me – that’s ok – you knew lots and lots of people! I just wanted to thank you for some fun memories! Hope all is going well for you. I live in North Branch, MN now with my husband, Denny. He was actually the President at Rolco in Kasota from 1995 – 2000. Take care Ann and God bless! !